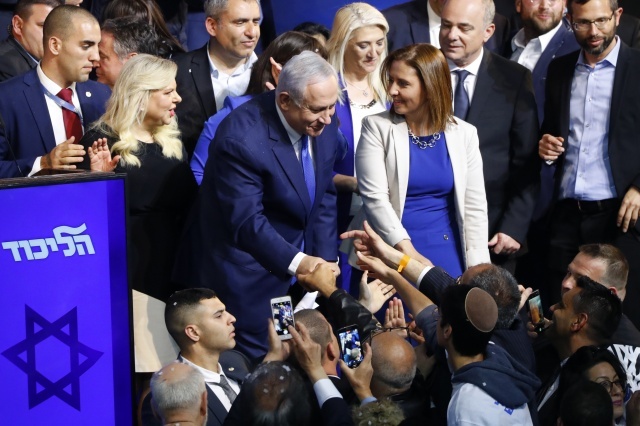 (AFP) - Prime Minister Benjamin Netanyahu appeared best placed to form a governing coalition Wednesday after high-stakes Israeli elections, exit polls showed, but remained in a tight race with his main rival as votes were being counted. Two updated exit polls early Wednesday put Netanyahu's Likud ahead of Gantz's Blue and White by one seat. A third poll showed the opposite, with Blue and White holding a one-seat advantage. With some 64 percent of the vote counted, Likud had 27.59 percent compared to Blue and White's 26.04 percent, official results showed. Addressing cheering supporters who waived Israeli flags at an event hall in Tel Aviv, Gantz called it an "historic day." Shushan Levi, 61, called Gantz's performance an "enormous victory for an alliance so new." "Once he announced he was entering politics, I followed him," he said at Blue and White's party. "He was my commander in the army 40 years ago." If he does triumph, "King Bibi," as some have called him, also faces the prospect of becoming the first sitting prime minister to be indicted.